A woman’s digestive system is longer than a man’s, and her colon has to share space with her uterus, fallopian tubes, and bladder. 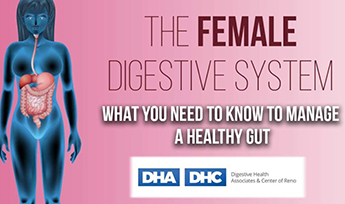 Her digestive system is also affected by hormonal fluctuations, which can cause fluid retention, bloating, constipation, and slowed digestion. The movement of food through her large intestine can take up to 47 hours—14 hours longer than it does in a man. Women are also twice as likely to struggle with IBS (irritable bowel syndrome) as men. These features mean a woman’s GI symptoms must be assessed and treated differently. For instance, it may be a weak pelvic floor, rather than a lack of fiber, that causes chronic constipation. Regular exercise, avoiding stress, and reducing sugar and artificial ingredients in the diet can help to reduce your GI symptoms. The Female Diet: Due to a longer colon, slower digestion, and more relaxed abdominal wall, women are prone to bloating and GI discomfort after large meals. Smaller, frequent meals are best. Whether you’re a man or a woman, you deserve the best GI care. Digestive Health Associates and Heath Center Reno are staffed by some of Reno’s leading board certified, gastroenterologists and a medical team that specializes in gastrointestinal health. Get top-level, expert care that fits your budget, and enjoy the comfort and convenience of safety-certified facilities, accessible parking, and curbside patient drop-off and pick-up.